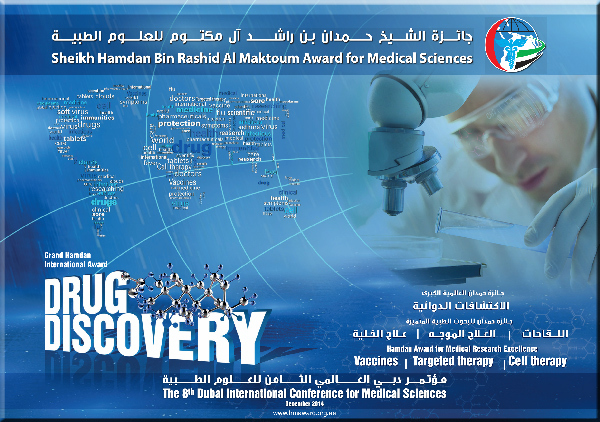 The topics of the 8th term, 2013-2014 were selected to be for Grand Hamdan International Award -Drug Discovery, and for Hamdan Award for Medical Research Excellence - Vaccines, Targeted Therapy, Cell Therapy. Scientists have begun to understand the inner workings of human disease at the molecular level with the advances in genomics، proteomics and computational power. Today with the increased knowledge we are better placed to use this knowledge in the development of new and effective drugs. In 1900، three illnesses، pneumonia, tuberculosis and diarrhea caused a third of all deaths in the United States. Only pneumonia is still on the list of 10 most common causes of death. The life expectancy in 1900 was 50 years as against 77 years in 2000، and this was achieved to a large extent by not only improvements in sanitation and hygiene but also to the availability of drugs to control infection, hypertension, hyperlipidemia, and to some extent even cancer. Posssibly the earliest written record of medical therapeutics is contained in the famous Ebers papyrus, a 20-metre-long, 110-page medical scroll, named after the German Egyptologist Georg Ebers, who acquired it in 1872. This valuable document described hundreds of treatments for the many aliments inflicting ancient Egyptians around1500 BC. These concoctions were prepared by mixing together various herbs, shrubs, leaves, inerals, and animal excreta. These must have had a strong influence on later generations when knowledge of herbal products became more organized, as evidence by Greek, Roman, and Indian cultures, as well as traditional Chinese medicine. The history of drug discovery in the pharmaceutical industry and academic labs over the past half-century shows a progression of discovery paradigms that began shortly after“miracle drugs” such as the penicillins became available to the public after World War II. That same decade also saw the rise of synthetic organic chemistry which had progressed to the point that the large scale preparation of “non-natural” drugs or drug candidates was economically feasible. The development of small molecule therapeutic agents for the treatment and prevention of diseases has played a critical role in the practice of medicine for many years. In fact, the use of natural extracts for medicinal purposes goes back thousands of years; however, it has only been in the past half century or so that searching for new drugs has found itself in the realm of science. Salicyclic acid, the precursor of aspirin, was isolated in 1874 from willow bark. Other more potent painkillers, such as morphine and codeine, were isolated from the opium poppy. The anti-malarial agent, quinine, was separated from cinchona (china bark). The leaves of the purple foxglove plant provided an excellent source of digitalis that was purified for use against heart disease. There are numerous other examples. Although synthesis of the first synthetic pharmaceutical drug, aspirin, occurred in the latter half of the nineteenth century, it was not until the early 1900s that the recognition of aspirin as a universal pain reliever was realized and this discovery spawned the era of therapeutic agents. In the past 50 years, vaccines have saved more lives worldwide than any other medical product or procedure. But the fascinating story of vaccination goes back all the way to ancient Greece when in 429 BC Thucydides noted that sufferers of smallpox who survived did not become reinfected. China was the first country to use a form of vaccination called variolation in 900 AD, in which healthy people were exposed to tissue from scabs by placing it 16 under the skin or in powdered form was inserted up the nose with the aim of preventing small pox from occurring. In 1796 Edward Jenner from England discovered vaccination in its modern form. Louis Pasteur improved on the vaccine and developed one against rabies in the 1880s. In 1890, German scientist، Emil von Behring, was awarded the first Nobel Prize in Physiology or Medicine for discovering the basis for vaccination against diphtheria and tetanus. There has been renewed interest in Vaccine research and development (R&D) particularly as health care authorities increasingly acknowledge the benefits and costeffectiveness of vaccination. These efforts have saved lives، decreased human suffering, and reduced health care costs, thus protecting the well being of individuals and societies around the world. Several factors have fuelled these efforts, including the lack of vaccines currently available for several major infectious diseases (e.g. malaria, hepatitis C, and acquired immunodeficiency syndrome, AIDS); the need for viable alternatives to antibiotics to help fight infection; concerns regarding emerging infectious diseases as well as potential threats such as pandemic influenza and bioterrorism. The development of a safe and effective prophylactic vaccine against HIV/AIDS is one of the highest priorities of the National Institute of Allergy and Infectious Diseases, part of the National Institutes of Health (NIH). Numerous experimental prophylactic HIV vaccines have been tested in human clinical trials. Only three large-scale HIV vaccine efficacy trials have been completed to date: two provided no evidence of efficacy despite the fact that the vaccines induced an immune response in many trial participants, then most recently, products tested in a third trial in Thailand demonstrated modest efficacy at preventing HIV infection. The significant results from this latest trial have recharged the HIV vaccine field and highlight the importance of testing promising HIV vaccine concepts in carefully planned clinical research studies. Other developments include a highly efficacious vaccinia-based dual vaccine against small pox and anthrax, DNA vaccines against parasitic disease, tropical disease vaccines, malaria vaccine, Group B Streptococci conjugate vaccine, Newer TB vaccines, plant derived vaccines, and novel adjuvant systems. Targeted Therapy blocks the growth of cancer cells by interfering with specific targeted molecules needed for carcinogenesis and tumor growth، rather than by simply interfering with all rapidly dividing cells (e.g. with Targeted therapy traditional chemotheray). Radiotherapy is not considered a ‘targeted therapy’ despite it being often aimed at the tumours. Targeted cancer therapies are expected to be more effective than current treatments and less harmful to normal cells. There are targeted therapies for breast cancer، multiple myeloma، lymphoma، prostate cancer، melanoma and other cancers. The definitive experiments that showed that targeted therapy would reverse the malignant phenotype of tumor cells involved treating Her2/neu transformed cells with monoclonal antibodies in vitro and in vivo by Mark Greene in 1985.Targeted cancer therapies interfere with cancer cell division (proliferation) and spread in different ways. Many of these therapies focus on proteins that are involved in cell signaling pathways، which form a complex communication system that governs basic cellular functions and activities، such as cell division، cell movement، cell responses to specific external stimuli، and even cell death. By blocking signals that tell cancer cells to grow and divide uncontrollably، targeted cancer therapies can help stop cancer progression and may induce cancer cell death through apoptosis. Other targeted therapies can cause cancer cell death directly، by specifically inducing apoptosis، or indirectly، by stimulating the immune system to recognize and destroy cancer cells and/or by delivering toxic substances directly to the cancer cells. The development of targeted therapies، therefore، requires the identification of good targets—that is، targets that are known to play a key role in cancer cell growth and survival. For example، most cases of chronic myeloid leukemia (CML) are caused by the formation of a gene called BCR-ABL. This gene is formed when pieces of chromosome 9 and chromosome 22 break off and trade places. One of the changed chromosomes resulting from this switch contains part of the ABL gene from chromosome 9 fused to part of the BCR gene from chromosome 22. The protein normally produced by the ABL gene (Abl) is a signaling molecule that plays an important role in controlling cell proliferation and usually must interact with other signaling molecules to be active. However، Abl signaling is always active in the protein (Bcr-Abl) produced by the BCR-ABL fusion gene. This activity promotes the continuous proliferation of CML cells. Therefore، Bcr-Abl represents a good molecule to target. Cell therapy originated in the early 1800s، when Dr Charles- Edward Brown-Séquard (1817–1894) injected animal testicle extracts to stop the effects of aging. Later Paul Niehans (1882– 1971) practiced cell therapy using calf embryo cells in Switzer- land. Originally cell therapy meant blood transfusion، bone marrow and organ transplantation، tissue banking and reproductive in vitro fertilization. Modern cell-based therapies have progressed from the first recorded human–human blood transfusion by James Blundell (Guy’s Hospital، London، UK) through to the ad-vanced cellular therapies of today. This 200 year journey، based initially on clinical trial and error and more recently on labora- tory science، has culminated in the necessary critical mass and unique challenges to justify being a distinct industry in its own right. Modern cellular therapy obtained its scientific legitimacy mainly from the field of bone marrow transplantation. The first breakthrough was provided by Prof Jean Dausset who in 1952 performed the experiments that lead to the identification of the first of many HLA antigens on the surface of cells. The under- standing that body identifies itself through its HLA antigens، and when it does not recognize the patterns of an HLA antigen an immunological response is initiated، opened the field of al- logeneic bone marrow transplantation. For his pioneering work Dr Dausset was granted the Nobel Prize in Physiology or Medi- cine in 1980. In the late 1950s his discoveries led to the first successful transplant of cells between identical twin patients. The transplant was performed by Dr E. Donnall Thomas، who went on to receive the Nobel Prize in physiology or medicine in 1990. Consequently، additional milestones in the area of cell trans- plantation were achieved and in 1968، in Minnesota، the first successful non-twin (allogeneic) transplantation took place. This was followed by the first unrelated bone marrow trans- plant in 1973، when a boy with a genetic immunodeficiency disorder received multiple marrow transplants from a donor identified as a match through a blood bank in Denmark. Stem cells from cord blood were successfully transplanted in 1988، in Paris، when it was used for the first time to regenerate blood and immune cells on a 6-year-old boy suffering from Fanconi anemia، and in 1997 a successful cord blood transplant was performed on an adult suffering from chronic myelogenous leukemia using cord blood cells that were expanded ex vivo. Another scientific leap occurred in 1998، when James Thomp- son from the University of Wisconsin – Madison developed the first embryonic stem cell lines. The capacity to generate dif- ferent cell types from a common cell ancestor under control conditions and the increased understanding on how to grow cells ex-vivo، boosted the basic research and development of potential cell products in the field of regenerative medicine. Ini- tially the studies were aimed at replacing cells that were dam- aged by disease with cells grown ex-vivo، however the field evolved and cells are instead used as secretors of factors that can ameliorate or change the course of disease. Due to the ethical controversy associated with the use of em- bryonic cells for research purposes، the field suffered a tem- porary setback، however in 2006، Shinya Yamanaka’s team at Kyoto University، Japan first generated induced pluripotent stem cells (iPSCs) from mouse fibroblasts and in November 2007، James Thomson at University of Wisconsin–Madison and Shinya Yamanaka and colleagues، reported the produc- tion of iPSCs from adult human cells. This scientific discovery serves as a catalyst for new research in the area of regenerative medicine and diagnostics based on cellular therapies. During the last 20 years stem cells and adult cells derived from differ- ent tissues such as blood، bone marrow، muscle، brain، hair، skin، etc.، have been characterized، grown in culture and tested in animals and in the clinic for a diverse number of illnesses. Prof Magid Abou Gharbia is an outstanding and unique scientist. His contribution to drug discovery is exceptional. He discovered eight marketed drugs such as: Mylotarg, Torisel, and Bosulif which are available in the market for treatment of cancer. Stanley Plotkin has made an outstanding and exceptional impact on the field of vaccinology. He not only developed the rubella vaccine, which saved millions of children from congenital abnormalities, but has contributed to the development of a pentavalent rotavirus vaccine, an anthrax vaccine, the oral poliovirus vaccine, the cultured rabies vaccine and a varicella vaccine. Dr June has made breakthrough discovery of cell therapy for leukemia. He has undoubtedly made seminal contributions that exemplify the intersection of basic and clinical science. Prof. Olle Ringdén was the first to study the human immune system from all lymphoid organs with functional and surface markers and found a compartmentalization of the immune system (2)*. Jimmy Carter, born in the farming town of the Plains of Georgia, was the 39th president of the United States elected in 1976. Significant foreign policy accomplishments of his administration included the Panama Canal Treaties, the Camp David Accords, the treaty of peace between Egypt and Israel, The SALT II with the then Soviet Union, and the establishment of US Diplomatic relations with China. He has championed human rights throughout the world. Noor Dubai Foundation was launched on September 2008 and established by law in 2010, with a vision of a world free from avoidable causes of blindness. It provides therapeutic, preventative, and educational programs to treat and prevent blindness and visual impairment in developing countries on a regional and international scale. Mads Fredrik Gilbert is a Norwegian doctor, activist and politician from the far left revolutionary socialist party Red. He received his PhD at the University of Iowa in Iowa City, Iowa. He is a specialist in anesthesiology and a leader of the emergency medicine department of University Hospital of North Norway, and has been adjunct professor (professor II) of emergency medicine at the University of Tromsø since 1995. The Ebola outbreak in West Africa has killed more than 2000 people across four countries. That includes dozens of health workers who caught the disease, 1058 in Liberia alone. Many of that country’s health clinics and hospitals have shut down as nurses and doctors refuse to risk being exposed. The College of Medicine and Health Sciences at Sultan Qaboos University (COMHS-SQU) was established in 1986 with the inauguration of the Sultan Qaboos University (SQU); the leading national university in the Sultanate of Oman. COMHS contains 19 academic departments and employs 75 academics in the COMHS (of whom 25 are clinicians) and 214 clinical tutors at University Hospital (SQUH), who share the responsibility of delivering the MD Program with the aid of 115 more clinical tutors in other affiliated Ministry of Health (MOH) hospitals. The Department of Neurology was founded in 1974 with the foundation of the National Institute of Neurology by Late Professor Mongi Ben Hamida. The Department of Neurology was the first department of neurology created in Tunisia. The official inauguration took place March 20th, 1974 by the President of the Republic of Tunisia Habib Bourguiba. He was one of the founders of the Ghoneim Urology and Nephrology Center (WHO Collaborating Centre for Management of Renal and Urological Disorders, Mansoura, Egypt. He is also a member of the International Society of Urology, a member of the British and American Urology Associations. Zohair Yousef Al Halees is a Saudi Pediatric heart surgeon and presently working in the Heart Centre at King Faisal Specialist & Research Centre in Riyadh. After completing his primary and secondary education from Jeddah, Saudi Arabia he joined in King Saud University Medical School(formerly known as Riyadh University) for his premedical studies, preclinical studies and clinical studies till 1976 and he completed his internship in 1977 with University Hospital and Hospitals under the Ministry of Health. The Department of Paediatrics at Tawam has been providing testing clinical screens to the newborns, infants and children up to the age of fifteen years in the UAE and neighbouring countries. This combined department provides comprehensive care for patients suffering from various cardiac diseases, there is involvement in teaching and education in respective fields. The department was the first centre in Dubai to perform coronary angiography and other angiographic procedures (1998) in Dubai open heart surgery (1992) and the in UAE the first cardiac pacemaker insertion (>30 years ago). Cancer is the most common cause of death worldwide. Most patients with cancer receive radiotherapy as a treatment. Despite recent progresses in treatment of human tumors, new therapeutic modalities are still needed to improve cancer patient survival. Hepatic stellate cells are involved in the invasiveness of cancer cells through transdifferention into myofibroblast-like cells, which are characterized by the expression of alpha-smooth muscle actin. 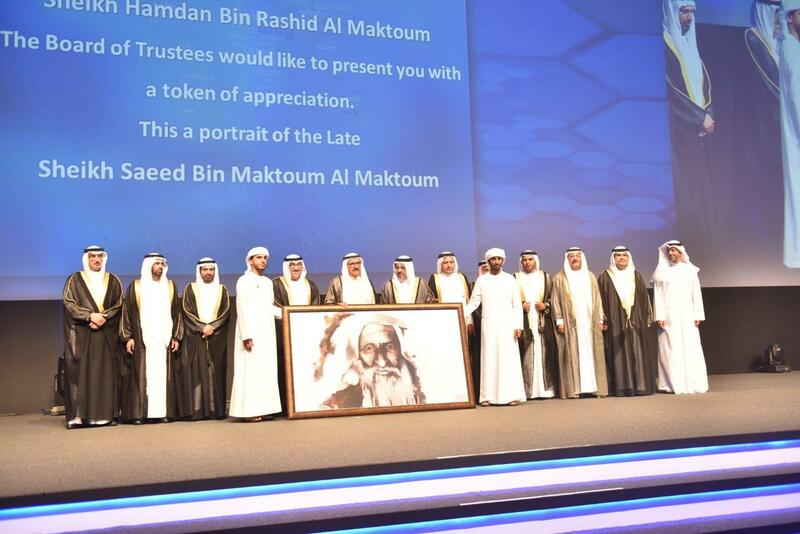 The late Emirati Businessman; Mr. Abdulsalam Rafi – may Allah have mercy on him – was a prominent social figure, who played a highly significant role in the charitable and humanitarian domains in the UAE and abroad. Mr. Rafi exhibited distinct philanthropic and patriotic tendencies at all times; and he had always been offering help to his fellow citizens whenever it was needed. Through numerous impressive initiatives, Mr. Rafi shared wealth with the wider community and helped to spread good will among various branches of society. Dr. Ahmad Abdulaziz Al Jaziri is a consultant in general and laparoscopic surgery. 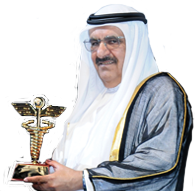 He is one of the leading Emirati physicians in UAE. 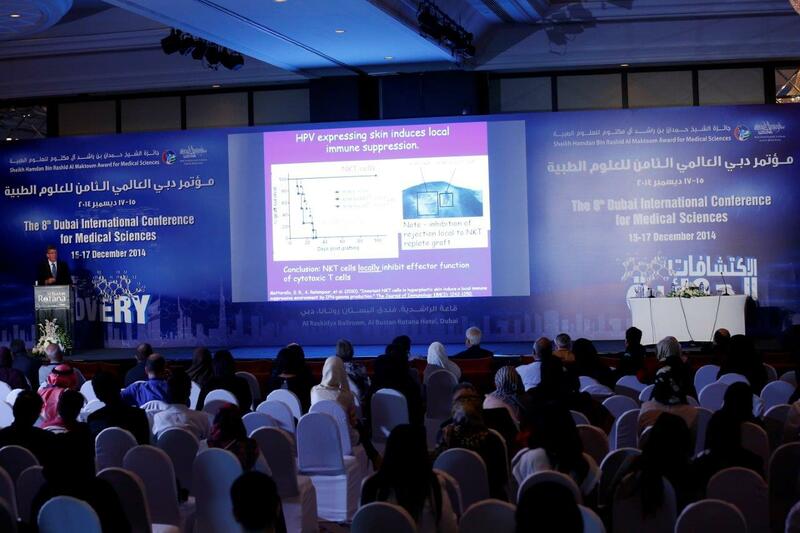 Dr. Jamila Al-Suwaidi is a Consultant in “Radiation in Medicine Developments” at the Department of Medical Education in Dubai Health Authority. She is the Emirati Counterpart for National Projects in-cooperation with the International Atomic Energy Agency (IAEA). 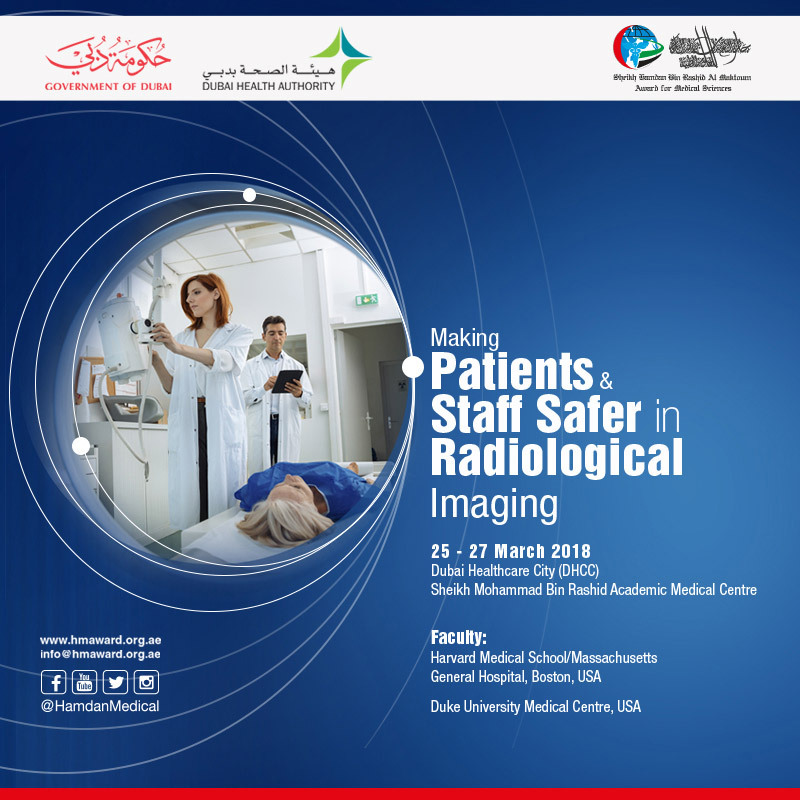 Additionally, Al-Suwaidi heads a Research Project in Patient Radiation Dosimetry in diagnostic radiology. Dr. Elham Mohamed Al Amiri is a prominent consultant pediatrician and a renowned academic in the UAE. Dr. Al Amiri received her medical degree from King Faisal University in Saudi Arabia in 1993, and then she obtained her Master’s degree in Pediatrics from Trinity College at the University of Dublin (Ireland).